Meningitis is a serious condition that occurs when the meninges (the membrane covering the brain spinal cord) and cerebrospinal fluid (CSF) are inflamed. This inflammation occurs, in most cases, an infection, bacteria or viruses being the most common agents. In this article we will cover the signs and symptoms of meningitis, dividing the explanations according to age and the causative agent of infection of the meninges. Bacterial meningitis in adults is usually a picture of rapidly evolving, with rapid worsening of the clinical condition in a few hours. In general, the patient enters a hospital for only 24 or 48 hours after the onset of signs and symptoms of meningitis. The time of incubation, i.e., the interval between infection and the onset of symptoms, usually 3 to 4 days. The most common signs of meningitis is high fever, present in 95% of patients. In elderly patients, there may be no fever, but hypothermia with an axillary temperature below 36°C. The fact is that, whether fever or hypothermia, the patient with meningitis often has a change in body temperature. Another often this sign is neck stiffness, which occurs in about 90% of cases. The stiffness of the neck can be noted on physical examination the patient's pain and inability to lower the head and touch your chin to your chest, even with the help of the examiner. It's not just lower your head, move your neck is also difficult and painful. 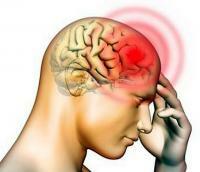 The headache is also a common symptom of meningitis. It is usually an intense, diffuse pain throughout the skull. Even patients who often have a headache are often able to say that the pain is worse meningitis and different. Changes in the level of consciousness occur in up to 80% of patients and is usually the signal that makes the family look to take the patient to the hospital. Lethargy and confusion are the most common presentations, but up to 1/5 of patients can reach the hospital already comatose. 4 signs and symptoms described above (fever, neck stiffness, headache and mental changes) are considered the classic symptoms of meningitis. They need not be present at the same time, but 99% of patients with meningitis have at least 1 or 2 of these symptoms. In patients with meningococcal meningitis, which is the one caused by the bacterium Neisseria meningitidis , also known as meningococcus, there may be small punctate spots, red or violet, the body, called petechiae. One way to distinguish the rash of meningococcal meningitis rash other causes, such as allergies or mosquito bites and compressing the lesions with a transparent glass to see if they disappear. Petechiae in meningitis do not disappear. This test is called test glass or tumbler test. Importantly, petechiae may arise for other reasons, not being an injury that appears exclusively in meningitis. Anyway, whether or not suspected meningococcal meningitis, every patient who develops sudden and extensive rash should seek medical attention. In children, bacterial meningitis usually has two distinct presentations. In some cases, meningitis is a more drawn picture with the child with fever without apparent cause for a few days before the more specific symptoms appear. The other way is a fulminant meningitis with rapid worsening of the clinical condition of the patient in a few hours and high mortality. The older the child, the more like the adult meningitis are the symptoms. Neck stiffness, headache, fever, decreased mental status and vomiting are common signs. In meningococcal meningitis, red spots in the body can also arise. In very young children, fever and neck stiffness may not occur, although hypothermia is common. Meningitis caused by viruses can cause symptoms similar to bacterial meningitis. The difference is that the viral form is less severe and mortality is much lower. This does not mean, however, that the clinical picture may not be very rich, with diffuse muscle pain, vomiting and weakness. Many patients do not exhibit the classical neck stiffness and their neurological status remains more or less stable. In general, fever and headache are the most obvious symptoms. Viral meningitis usually occur as a complication of a viral infection. The patient may also have common symptoms of respiratory virus, such as sneezing, coughing, pain gargante and conjunctivitis. As in adults, viral meningitis in children is usually less severe than the bacterial form. Most cases are caused by enteroviruses, they heal themselves with time and leave no sequelae. In older children, the symptoms are similar to those of adults. In children, however, the stiff neck is more common and fever is usually very high. In small infants and children, the story is a little different. In this group, viral meningitis can be severe, causing death or leaving sequelae. Complications such as pneumonia, hepatitis, myocarditis, cerebral edema and intestinal ischemia may occur, increasing the risk of death. Clinically, only the symptoms can be difficult to distinguish a viral meningitis bacterial. The distinction, in fact, is the lowest mortality rate and the number of complications, but it only becomes clear at the end of the frame, when the patient is fully recovered with no further sequels. During the course of the disease, the only way is to distinguish through laboratory tests, particularly the analysis of CSF obtained via lumbar puncture. The distinction between viral and bacterial meningitis is important, because the first to be treated with antibiotics, while the second one simple need care.